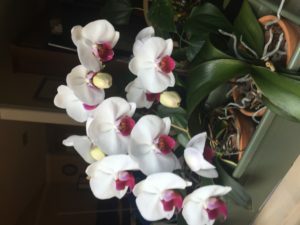 I got my first orchids after moving into a freshly remodeled house five years ago. Home renovation shows always include an orchid or two in the “after” footage. I thought it was a rule. Though space for a plant was limited, the master bathroom seemed like an ideal location. My first two selections were miniatures with variegated foliage and mauve-ish flowers on four-inch stems. They were small, in pots that matched my color scheme, and inexpensive. Dormant orchids in net bags rather than pots were so cheap, I decided to try one of them as well. The bathroom wasn’t nearly as well lit as I thought. 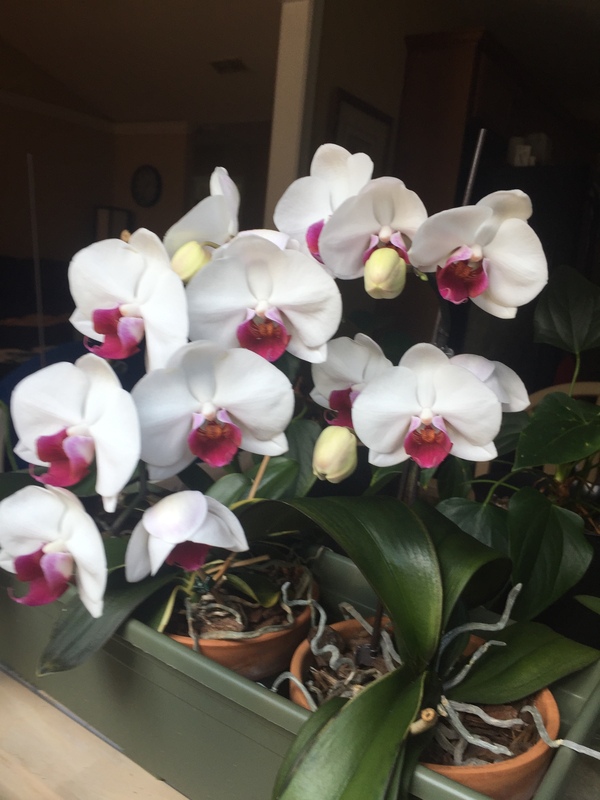 After a few weeks, I moved my trio of orchids to my kitchen table. It’s about two feet from a big window and gets an hour or two of morning sun and bright light throughout the day. To be honest, I didn’t expect my orchids to live for more than a few months. Not only were they still alive a year later, the variegated plants had bloomed again. I was hooked. Over the next few months, I picked up six more. I have no idea what kind they are. Most were out of bloom when I bought them and marked down to ten dollars or less. My orchids require very little attention. 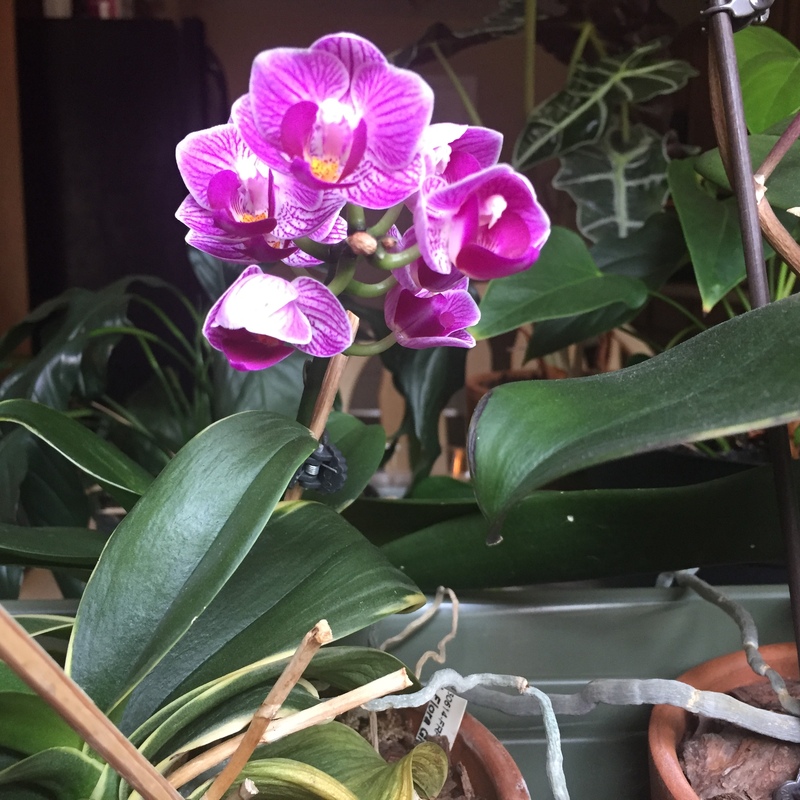 I place ice cubes in the pots to water them every few weeks and douse them with liquid orchid food maybe twice a year — when the thought occurs to me. When it rains in warm weather, they might go outside for a few hours or overnight. Once in a while, I remove dead flower stalks and leaves. I must be doing something right. 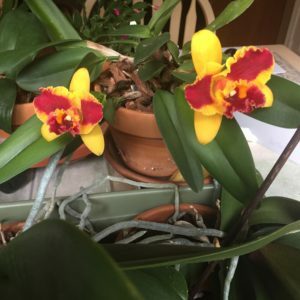 At least one of my orchids has been in bloom for the past five years. Each new bloom is a bigger surprise than the one before. The long-lasting flowers typically emerge between November and March, but have also bloomed in other months. The dormant orchid I bought is my fastest grower. Rather than up like all the rest, it tends to spread. After five years of growth, it finally bloomed last month. Without flowers, I can’t tell my orchids apart. Whether individual plants bloom more or less frequently than every year is a mystery. Marking the pots and keeping track of bloom times would make predicting when each plant is likely to bloom possible. Frankly, I’d rather be surprised.